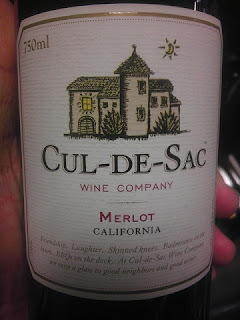 Just discovered Cul De Sac...was really surprised how good the Cab was.No, it's not one of those BIG bad old world cabs that I love, not even sure it tastes like a cab at all, but it is a decent red wine with some complexity to it...a real surprise in a $3 wine! As a West Coast native, exiled in Dallas, I think I've found a replacement for 2 buck Chuck...just when DFW is finally getting its long-awaited first Trader Joes! Central Market has this stuff at the Fort Worth Store by the truck-load...at first I sorta upturned the nose...but necessity required I "cut back" on things and the first to go was the $10-$15 bottles of wine. This $3 stuff drinks like the $10-15 bottles...a winner! 5 bottles for $15 What steal what a find! It's the only wine that we buy now. The problem is that, because it's so cheap, there is really no incentive for my wife and I to not each drink a whole bottle. Another big plus is that there is never an issue with hangovers. their sweet red wine is my favorite wine and practically the only one I can truly say I enjoy. I really wanted to enjoy wine. I love the whole ide of it. The history and heritage, the culture. Pretty much the only thing I did not enjoy about wine was the taste! :) so I went on a mission to try as many wines as I could, all price ranges. 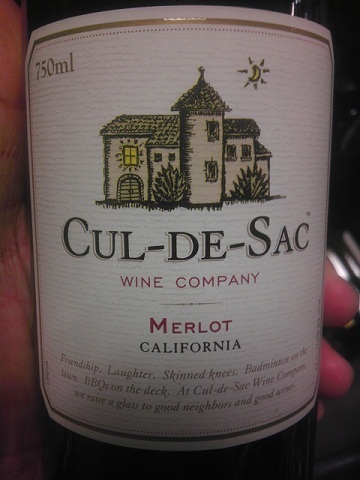 Cul de sacs sweet red something I tolerate, but something I actively enjoy and seek out. Unfortunately I'm having a hard time finding it locally now. Unbelievable. This is the worst.